Those bugs manifest with seg faults and hangs, so you could be running in to one of those. The octave-head-test formula does include these patches, which could explain why the crash went away when you switched to using it. Those notes are probably all fine, and expected; they're issued for any keg-only formulae, of which octave uses a few. The octave or octave-head-test formula will automatically take care of those export commands for you when it does the build. 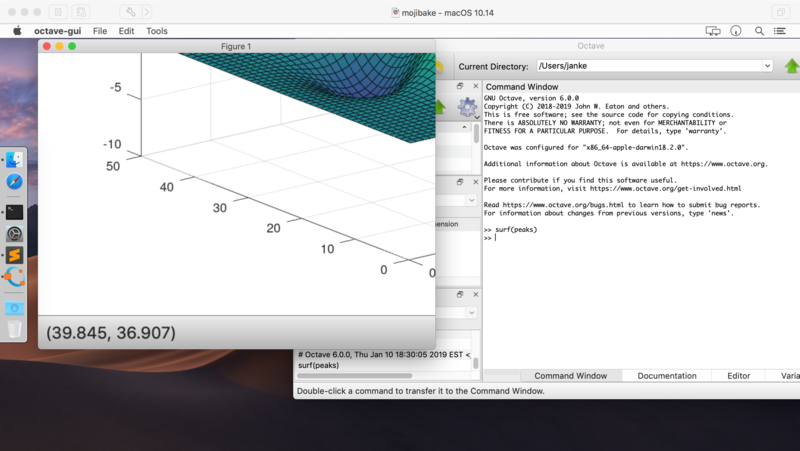 to install qt but not gnuplot. Shouldn't matter. The octave or octave-head-test formulae will automatically install all their dependencies. I couldn't reproduce this "blank figure window" behavior on macOS 10.13.6 High Sierra using octave-head-test: running your code, the plot appears fine for me there. On 10.14.2 Mojave, I can reproduce your exact behavior: the figure window is blank after doing a plot(). (I set up a 10.14.2 Mojave VM for testing.) Screen shot attached. Happens when I do it from the GUI (`octave --gui`) too. Resizing the figure window a bit causes the plot graphics to appear. They're mis-scaled for me; probably a Retina scaling issue. Screen shot #2 attached. That's probably because octave-head-test does not include the patch for https://savannah.gnu.org/bugs/?49053. Does resizing the figure window make plot graphics appear for you? No idea what's causing it. I can just say it looks like new behavior in Mojave. Would you mind sharing your full build logs so we can see exactly what your Octave was built with? You can do this with `brew gist-logs octave-head-test` and sending along the resulting URL. Here's mine for reference. I don't see anything weird in there, offhand.